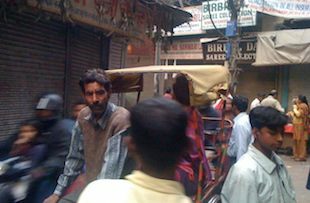 The young Swedish internet entrepreneur barely has time to put down his bags in the hotel room in New Delhi , his first visit to India in October 2013, before the hotel porter notices the TrueCaller-sticker on his bag. 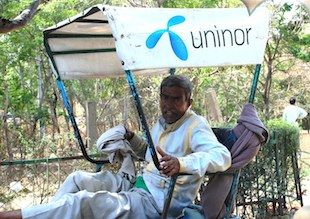 "Do you work for TrueCaller , that's great I use it all the time ," says the porter and his colleague nods. Truecallers CEO and founder Alan Mamedi is dumbfounded. How is it possible that his small company can , it seems, be on everyone's lips in the world's second largest country? Alan Mamedi: I've never been here before and did not do any special marketing efforts beyond then search engine optimization. The story is told by Alan Mamodi to reporters on Dagens Industri 's podcasting blog. The answer, it seems, that TrueCaller , an app that has taken it upon itself to house all the world's phone number, have found a untapped, irrefutable need that no one has yet been able to exploit in the most straight and brilliantly simple manner without any social media frills or other trickery. TrueCaller's app is easy to registerar on, there are no complicated forms and details, just the phone number. And its free. What you trade to get the service is your number, exactly the information that directly helps Truecaller to instantly accumulate value. TrueCaller was founded in Stockholm in 2009 by two fledgling computer network student who discovered that there was no straight and simple way to get a phone in other countries. They had earlier in quick succession started a furniture site and job gossip site . Both were sold quickly for a five digits amount. The founders Alan Haredi and Nami Zaringhalam put all the money in their new project, TrueCaller , as they were more interested in a project that could be scaled up globally. After four years, they are already well on the way to stitch up all the world's phone number. It looks like a David against Goliath battle, a stat-up against all those huge 100 year old phone directory companies. But not really. Directories of type yellow pages has never bothered about the home phone number market, too complicated and inaccessible to extract value out of for others than telemarketers. But with smartphones and apps , the situation is completely changed. What was almost useless has become an almost invaluable component in the increasingly ingenious war of algorithm's that ultimately aims to profile each and every one of us. And as with free mail services, Facebook, Instagram and Twitter we are happy to part with yet another piece of personal information in exchange for the opportunity to easily find other peoples phone numbers. Truecaller's founder Alan Mamedi is secretive about sales when he was interviewed by the Dagens Industri 's podcast blog but say's the company is getting close to breakeven. TrueCaller has 31 million users. Its biggest market is India , accounting for 53 percent of users . It is understandable that there is a market in India, the lack of review of who has the particular phone was almost complete before TrueCaller appeared. What is perhaps surprising is that all of this was done with the help of just one app, and search engine optimization. No marketing to speak of. And no fancy web design either. The owners build their own scalable site. They realized it was the best and safest way to house the site on your own server, rather than out of an expensive uncontrollable clouds. The website is a simple wordpress page , no frills , in other words . Alan Mamudi does not want to disclose exactly how much money the company has invested and burnt. But the numbers are comparatively limited. Truecallers has 31 employees and another ten coming in to do translation work in the fast expanding company. Rumors, according to Digitalbloggen, say Truecaller is about to bring in about $ 1.5 million from one or more venture capital firms. TrueCaller is growing at a breathtaking pace. 100,000 new sign up every day to compare with Twitters about 200-400 000. Though it is not just a question of quantity the phone directory service appears to be something of a slumbering beauty for prospective buyers . For sure Twitter has content that people constantly returns to. Users spend time on Twitter and it is therefore likely to command higher value from an advertising point of view. But not necessarily. The upside for TrueCaller is not just a zero-sum game. Its value as a un-locker of global metadata must be invaluable for those large digital multinationals who are in control of our innermost personal files by bringinging together our various profiles - searches, emails, positioning, cell phone number - into one. There are some lessons to be learnt. There is still room for small start-ups to gain global prominence in a relatively short space of time and with limited resources - if they have appeal for users. Truecaller, with nearly one billion phone number in its pocket already, proves its possible. Reasonably it's time for a really big players to take not of Truecallers true colours, and no doubt they have already, and start and make bids Alan Memedi and Nami Saringhalam find it hard to say no to.